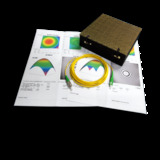 Master Cords are used to connect sophisticated test equipment to fiber or devices under test in laboratory or field locations. Supporting the test environment necessitates a product built with high quality components, to extremely tight specifications and documented with complete test data. The Applied Fiber Master Cords are perfect matches for these applications and requirements. Various cable and connector options are available and the finished product is shipped in its own protective package.